In addition to having 30 times the sensitivity of the current SPY-1 radar, the AMDR’s dynamic range will be greatly improved, particularly in areas with lots of interference from other emitters, jammers, and clutter. Another key attribute will be the AMDR’s digital beam-forming capability, which enables rapid horizon-to-horizon surveillance of air targets while simultaneously devoting much more energy toward ballistic missile defense. Small credits the unique properties of GaN for a large part of the large increase in performance. “It is a tremendous improvement enabled by the gallium nitride to be able to do that,” he said. Gallium nitride offers huge improvements in performance over gallium arsenide (GaAs)–based systems, which were developed for previous generations of AESA radars that are usually found on fighter aircraft. GaN-based T/R modules have the potential to provide better than five times the power per element of GaAs-based T/R modules in the same amount of space. Effectively that means that fewer high-powered GaN T/R modules are needed to match a larger number of low-power GaAs-based chips. GaN is also much more efficient in converting electrical power into radio waves. But there have been concerns about the readiness of GaN for a production program. During the early years of development of the GaN material, production yields for the semiconductor were low and rejection rates were high. Moreover, many devices that used the technology suffered from poor reliability due to the extreme electrical currents running through such a small space. But those issues have been resolved, said Carl Herbermann, Northrop Grumman’s AMDR director, whose team is competing for the AMDR radar’s engineering and manufacturing development phase along with Lockheed and Raytheon. “Everything we’ve gotten to date indicates to us that the technology is ready for prime time,” he said. “The yields, and the improvement in those yields, both of which are happening at a faster rate than we would have anticipated.” The yields are already good enough for producing the AMDR, he said. Northrop also has built numerous prototypes and conducted long-term tests on GaN-based radars—some of which lasted for more than 5,000 hours. Northrop is continuing accelerated life-cycle tests on the technology even now, and the results look very promising, Herbermann said. “That operational life wants to be in excess of a million hours and we see no issue with meeting that requirement,” he said. Small is not the program manager for the Flight III Burke itself, but he said he is confident that the ship will have both the electrical power and the cooling necessary to mount the AMDR. 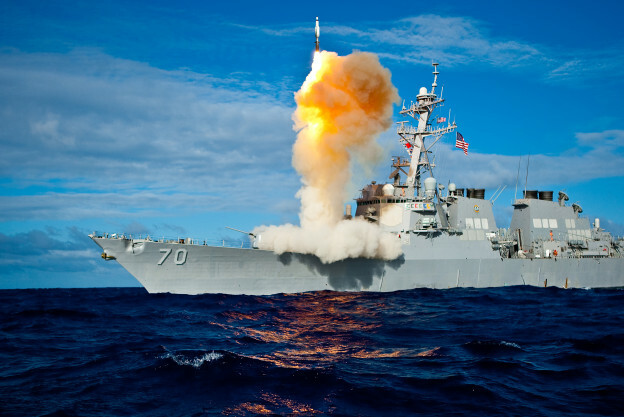 “Absolutely, the ship can not only handle this radar, it’s going to be able to handle this radar and have sufficient margin to have the growth capacity that the Navy needs,” Small said. Right now the program is set to go into source selection for the AMDR’s engineering and manufacturing development phase, Small said. He said he cannot talk about the details, but whatever radar is selected will have further software and hardware development ahead. It will also have to be tested extensively before it enters production to be delivered to the ship in 2019.